As Western powers look for an end game in Afghanistan, that country’s role as a planned transit route for natural gas from Turkmenistan deserves scrutiny. The long-planned pipeline, named TAPI after the initials of the four participating countries (Turkmenistan, Afghanistan, Pakistan and India), has been prominently discussed in the Asian press but rarely mentioned in the West. The TAPI pipeline is geopolitically significant, but has major challenges that have not been widely discussed. A Gas Pipeline Framework Agreement, signed by representatives of the four participating nations on April 25, 2008 in Islamabad, envisaged construction to start in 2010, supplying gas by 2015. The announced 1,000-mile route would follow the ancient trading route from Central to South Asia, extending from the Dauletabad gas field in Turkmenistan along the highway through Herat, Helmand and Kandahar in Afghanistan, to Quetta and Multan in Pakistan, and on to Fazilka in India. Participating countries have held numerous high-level planning meetings during the past eight years, with Asian Development Bank (ADB) sponsorship and multilateral support. When construction will start is uncertain because security in Afghanistan and the tribal areas of Pakistan remains a problem. Source: Canadian Centre for Policy Alternatives. The ADB completed a feasibility study in 2005 that was updated in 2008. Details were outlined at the April 2008 meeting of the four participating countries. The ADB reported that the estimated capital cost was $7.6 billion, and said it would consider financing for the project. Turkmenistan promised independent certification of the gas available for the pipeline. Plans called for the line to be built and operated by a consortium of national oil companies from the four countries. A special-purpose financial vehicle would be floated, and international companies would likely join in laying and operating the pipeline. According to press reports, the Afghan delegation informed the meeting that more than 1,000 industrial units were planned near the pipeline route in Afghanistan and would need gas for their operation. They said 300 industrial units near the pipeline route had already been established, and the project's early implementation was essential to meet their requirements. Several bilateral meetings took place in 2009. In April, a Pakistani delegation visiting Ashgabat, Turkmenistan, suggested a new TAPI route that would skirt the war-torn area and add a spur to Gwadar, a Pakistani deep-water port. Turkmen officials stated they would offer gas from the Yasrak field, instead of the planned Dauletabad field, and they provided a reserves certification for Yasrak. In September 2009, the foreign minister of India, S M Krishna, visited President Berdimuhamedov of Turkmenistan for discussions that included terms of the TAPI pipeline project. If the pipeline goes ahead successfully, it could be Afghanistan's largest development project. According to the Ambassador of Afghanistan to Canada, transit revenue could amount to US$300 million per year. That would represent about one-third of the domestic revenue (US$887 million in 2008/09) budgeted for development efforts. Transit fees could help pay for teachers and infrastructure. Even so, Afghanistan's domestic revenue is dwarfed by aid. Foreign donors contribute about 90 percent of total funding for the development budget, and they call the shots. 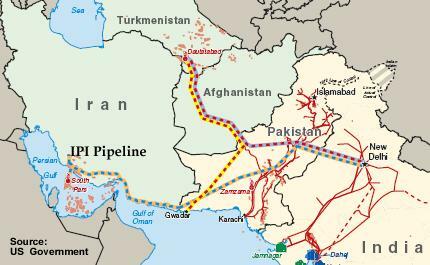 The US has promoted the TAPI pipeline since the 1990s. When the Taliban was governing Afghanistan, two consortia vied for the right to take on the project, one led by Unocal (an American firm) and the other by Bridas (an Argentinean firm). The US government supported the Unocal consortium. US negotiators participated in the Six-plus-Two conferences (the six countries bordering Afghanistan plus the US and Russia) from 1997 to 2001. The aim was to convince the Taliban to form a government of national unity. At the time, the Taliban controlled 90 percent of Afghanistan but not the area held by the Afghan Northern Alliance. Unocal testified to Congress that the pipeline "cannot begin construction until an internationally recognized Afghanistan government is in place. For the project to advance, it must have international financing, government-to-government agreements and government-to-consortium agreements." The Bush Administration urged the Taliban regime to form a government of national unity that would include the northern tribes. Bridas took a different approach—they negotiated separately with different tribes. The president of Bridas spent eight months visiting tribes along the pipeline route and reportedly had secured their cooperation for the venture. Negotiations with the Taliban broke down in July 2001, just before the attacks of September 11. In October, the US ousted the Taliban, with the assistance of the Northern Alliance. The Pashtun—roughly 40 percent of the population—are a major source of Taliban insurgents, and the pipeline route goes through the Pashtun area in both Afghanistan and Pakistan. There are about 30 million Pashtuns on both sides of the Afghan-Pakistan border. It’s an artificial border—the so-called Durand Line that was imposed by British India in 1893. It was drawn intentionally to break up the Pashtun tribes. In fact, Pashtuns in Kandahar were independent from Kabul for ages, and, until recently, Pashtuns in Pakistan were relatively independent from Islamabad. After the 2001 invasion, planning of the pipeline continued. Interim President Karzai met with President Musharraf in Islamabad in February 2002, where they announced their agreement to cooperate on the proposed pipeline. In May 2002, the heads of state of Turkmenistan, Afghanistan and Pakistan agreed to cooperate on the project, and a steering committee of oil and gas ministers was established to oversee project development. In July 2002, the steering committee requested the ADB to finance project-related studies through the provision of regional technical assistance. In subsequent years, steering committee meetings were held at frequent intervals. India participated in the tenth meeting in 2008, and the four countries signed the Gas Pipeline Framework Agreement. The next steering committee meeting was scheduled for November 2008 in New Delhi. The agenda was important. Price negotiations were to be advanced. Afghanistan was to report on physical security along the pipeline route, including the clearing of landmines and Taliban activity. Turkmenistan was to present the gas reserves certification. However, the meeting’s timing coincided with the Mumbai bombing, and was thus postponed. It was rescheduled for April 2009, though there was no subsequent press announcement to show it took place. This was hardly surprising, with the US surge underway in Afghanistan and animosity prevailing between India and Pakistan. Understanding the significance of the TAPI pipeline requires shining the spotlight on Turkmenistan, the source of the gas. Turkmenistan is one of five Central Asian states that became independent in 1991 when the Soviet Union broke up. Disagreement exists on how much gas the country actually holds. According to the BP Statistical Review 2009, Turkmenistan has the world’s fourth largest reserves of natural gas, 7.94 trillion cubic meters (TCM), exceeded only by Russia, Iran and Qatar. Turkmenistan’s 2009 ranking represents a sharp upgrade from 2008 (2.43 TCM). The new estimate follows the 2008 audit of the huge South Yolotan-Osman field in western Turkmenistan, conducted by the UK auditing firm Gaffney, Cline & Associates. The audit estimated the reserves of this field alone to be between 4 and 14 TCM of gas, making it the world's fourth or fifth largest field. Other fields remain to be audited, and Turkmen officials predicted in 2008 that the final results would be much higher. Since then, two publications have cast doubt on the audit results, relying on information obtained from unnamed Russian and Turkmen sources who suggest that Turkmen officials may have provided false data to exaggerate the size of the reserves. Gaffney, Cline & Associates refutes these allegations. Meanwhile, President Berdymukhamedov has dismissed various top energy officials. Whatever the truth of the matter, Turkmenistan’s gas reserves are huge and there is a titanic struggle underway. The geopolitical stakes are high. Turkmenistan is far from the world’s oceans, so it must rely on pipelines to get its gas to market. Like railway lines in the 19th century, pipeline routes are important because they connect trading partners and influence the regional balance of power. Until recently, Turkmenistan’s gas flowed only north through Russia. With the collapse of the Soviet Union, competing world powers have vied to move the gas in other directions. The rivalry is sometimes called the New Great Game, an update of the 19th century Great Game in Central Asia between the Russian and British Empires. Turkmenistan offers a hub for pipelines to export natural gas in all directions. President Berdimuhamedov is committed to multiple export routes: north to Russia, east to China, south to Pakistan and India via Afghanistan, and possibly west to Europe via the Caspian Sea. Significantly, in April 2008 at the NATO Summit in Bucharest, Romania, he met with President Bush to discuss gas export policy, and with President Karzai to review the TAPI project. Turkmenistan is concerned about pipeline security. It co-sponsored a Resolution on Reliable Energy Transit (63/210) that was passed by the UN General Assembly on December 19, 2008. The Resolution recognized the need for international cooperation to ensure “the reliable transportation of energy to international markets through pipelines and other transportation systems.” In April 2009, Turkmenistan convened a high-level conference on the topic, where President Berdimuhamedov re-iterated his position on multiple export routes. Russia remains a key player today. In 2007, it signed an agreement with Turkmenistan and Kazakhstan to build a new gas pipeline that would parallel an older one and add to its pipeline network. Russia is the world’s largest producer of natural gas and is a major supplier of gas to Europe. Currently, Russia is building pipelines (South Stream and North Stream) that would link its network to various points in Europe. From Russia’s viewpoint, they provide diversity, adding to the existing pipeline through Ukraine. In December 2009, China tapped into Turkmenistan’s gas reserves, opening a new pipeline from Turkmenistan that travels 1,833 km through Uzbekistan and Kazakhstan to reach western China. There it connects with the Chinese line east to Shanghai. Pipelines allow Turkmenistan’s gas to flow all the way to western Europe via Russia and east across China to Shanghai—enormous distances. The US and European Union support Turkmenistan’s policy of multiple export routes. They promote a pipeline project under the Caspian Sea to bring Turkmen gas west to Azerbaijan, where it would connect with the recently-built South Caucasus pipeline to Turkey. In Turkey, it would link with Nabucco, a planned pipeline to Austria. Russia, a littoral country on the Caspian Sea, objects to construction of the trans-Caspian link. Since Azerbaijan doesn’t have enough gas to fill the Nabucco pipeline, Turkey is exploring alternatives, including gas from Iran. The US objects to supplies from Iran. Iran has its own interest in gas from Turkmenistan. It imports Turkmen gas into northern Iran to supply local markets that are far from its own gas fields. In 2009, a second pipeline was completed to augment existing imports. That raises the question: Could this pipeline be used to route gas from Turkmenistan to Turkey—and on to Europe through the Nabucco line? For several years, India and Pakistan have been negotiating with Iran for another pipeline project to bring Iranian gas to their countries. With an estimated capital cost of $7.5 billion, the pipeline would be similar in cost to the TAPI project. Petroleum ministers of India and Pakistan met in Islamabad in April 2008 (just after the TAPI meeting) to resolve a pricing issue and clear the way for signing agreements; and President Ahmadinejad of Iran visited Islamabad and New Delhi the following week for talks on the pipeline. Since then, India has oscillated on the project and has stayed largely on the sidelines following a period of tense India-Pakistan relations. However, in December 2009, India’s petroleum minister, Murli Deora, said his country was discussing important issues relating to the pipeline with other participating countries. In May 2009, Iran and Pakistan went ahead and signed an initial agreement, without India. Russia’s Gazprom expressed willingness to help build the line, most recently in January 2010. The same month, US Special Envoy Richard Holbrooke met with Pakistan’s petroleum minister Syed Naveed Qamar, and, according to a Pakistani newspaper, he offered incentives to Pakistan to abandon the Iranian project. Subsequently, the petroleum minister told journalists that Pakistan and Iran would sign a technical agreement soon; he had met with the US ambassador and officials of US Overseas Private Investment Corporation who had expressed no objection to the project. In 2008, Iran and Pakistan proposed that China join the project. The foreign minister of China, Yong Jiechi, informed Pakistan’s foreign minister, Shah Mahmood Qureshi, that China was seriously studying this proposal. Iran’s foreign minister, Manouchehr Mottaki, affirmed in February 2010 that China is keen to join the project. The demand for energy imports is strong and the stakes are high. Moves by various countries to gain access or control are closely watched—The Grand Chessboard, as Zbigniew Brzezinski called it. After the TAPI agreement was signed in April 2008, the Afghan government reportedly told the steering committee that, within two years, the pipeline route would be cleared of landmines and Taliban influence. Whatever may have been anticipated then, the planned route remained insecure at the beginning of 2010. Companies are unlikely to make investments within a war zone. The prospect of building the pipeline under armed guard and then defending it for decades is formidable, in terms of both manpower and cost. How many NATO countries would be willing to make long-term commitments to support pipeline security in Afghanistan? In January 2009, Jaap de Hoop Scheffer, then NATO Secretary General, said, “Protecting pipelines is first and foremost a national responsibility. And it should stay like that. NATO is not in the business of protecting pipelines. But when there's a crisis, or if a certain nation asks for assistance, NATO could, I think, be instrumental in protecting pipelines on land.” These comments suggest that NATO troops could be called upon to assist Afghanistan in protecting the pipeline. Since pipelines last 50 years or more, this could auger a very long commitment in Afghanistan. While the focus has been on whether NATO countries are willing to support pipeline security in Afghanistan, an equally valid question is: Are the Afghan people willing to have foreign troops in their country in perpetuity? Development cannot take place at the end of a gun. As a noted Canadian, Claude Castonguay, observed: “No society changes because of an outside pressure, and certainly not by force of arms.” Conventional thinking around the pipeline may include long-term US bases in Afghanistan, and assistance in training the Afghan National Army to defend the pipeline route. Is the Afghan National Army a viable protection force inasmuch as 70 percent of its officers are Tajik and most of its troops are northerners? It too may be seen by the Pashtun as a “foreign” army. Indefinite occupation is a recipe for ongoing bloodshed and disruption in a country that has long been hostile to occupiers. The planned TAPI pipeline offers benefits to all four participating countries and would promote cooperation. For Turkmenistan, it would provide revenue and diversification of export routes. For Pakistan and India, it would address energy deficits. In Afghanistan, it would provide revenue for development and gas for industrial enterprises. The potential for export to other countries through the Pakistani port of Gwadar is a further advantage. TAPI is consistent with the US declared policy of linking Central and South Asia and diversifying export routes for Turkmen gas. For a number of countries, TAPI could provide business opportunities in construction and operation of the pipeline. Since the TAPI route passes through areas with major insurgencies, security is clearly an issue. In both Afghanistan and the tribal area of Pakistan, people along the route have long histories of independence from central and foreign powers. Unless their cooperation is sought and the benefits to them are clear, pipeline security will be an expensive nightmare for years to come. Peace is essential. Pipeline construction cannot begin until the killing stops and all stakeholders, including the Pashtun, participate in the project. Both Afghanistan and Pakistan are complex countries. Their mix of ethnic groups, long-standing tribal traditions, and history of minimal governance create major challenges. Such challenges require political, not military solutions. The strategy of national reconciliation offered at the London conference on Afghanistan in January 2010 is a beginning. TAPI is geopolitically significant, but encumbered with many difficulties that will challenge all participants in the years ahead. John Foster is a Canadian energy economist with worldwide experience in energy and development. He has held posts with the World Bank, Inter-American Development Bank, British Petroleum and Petro-Canada.